And having a team means you will need tools to display your team and tools to manage your team. Yes, more work to do. If you are using WordPress, you are in luck. There are plenty of WordPress team member plugins available in the market. And the great thing is, you don’t need to hire a developer to use these plugins. Most of them are very easy to use and come up with good documentation. Installing one more plugin means you are going to add some extra codes to your WordPress site. So it’s going to have some impact on your website’s performance. I am not telling you to stay away from using plugins just because it might have some impact. What I want you to understand is, do you really need a plugin for that? When it comes to WordPress Team Members Plugins, there are two types of plugins available. Showcasing Team Members & Managing Team Members. You can avoid using a team showcase plugin if you don’t need a fancy page for your team members or you are using a page builder. You can easily build a showcase page by using WordPress Editor. And if you are using a page builder, you can easily do so by using a builder. And the builder might even have a template for that. And when it comes to managing your team, there are not plenty of WordPress plugins available because of the availability of popular tools like Trello, Asana, etc. When other team management tools like Trello have better functionalities, it’s still a good idea to use a WordPress team management plugin if you want your team members to visit your site rather than going to other sites. It will help you to boost your Alexa ranking, and it may have a positive impact on SEO as you are going to get more direct traffic. Without further ado, let’s check the best WordPress plugins to showcase and manage your team efficiently. A free WordPress plugin created by the team at WP Darko. The plugin helps you add “teams” section, so you can display it wherever you want. It comes up with a simple WYSIWYG (What You See Is What You Get) tool. So you don’t need to worry about things being displayed differently. You can add members with a click of a button. You can add images and social media links. What is great about this tool is that it is updated frequently. There is also a pro version you can get, but as they say, the free version is not limited. Obviously, there are some extra features on the pro version. In Pro Version, you will get features like changing the picture when hovering, adding full-width pictures, picture filters and adding more social link profiles. Another great WordPress plugin by the developer Zemez. It offers a lot of options to help you customize the plugin to suit your needs. What is good about this plugin is that it integrates fully with Elementor Pro. This means more options to edit the theme, and help you display it in a good way on your page because you would already be using the gorgeous Elementor Pro. But to show things on the page, you may need to know some coding and see the instructions on the WordPress directory page here to set how many images to display, the size and so on. Yes, it is flexible, but it will need some time to edit things and display them as you want. Another great plugin to showcase your team from the elite author cmoreira at CodeCanyon. It is not a free one, but this plugin was sold 5,000+ times on CodeCanyon, indicating how good it is. This plugin has a lot of design options to choose from. You don’t need to go with one option. There is the normal grid appearance, the grid with information on hover (A simple yet effective one), the table layout, and the thumbnails pager layout. Of course, you can customize small details as you want like, the number of columns to be displayed, the images effects, alignment of the text, re-ordering members by drag and drop, and you can also choose from the different themes available under each style from the above. This plugin is a beast, and if your business is growing fast enough, 17$ won’t be a much with all the features you get. It is a free tool that makes it easy to display your team members in an animated and beautify way. You can add info about members, link to their page, link to their social media profiles, add their contact email and/or their phone number, and of course, add pictures to them. All you need to do is create user profiles and then add the shortcode [our-team] to any post, page or widget to display your team. There is also the basic features of ordering your members by simply dragging and dropping in the order you want. You could also upgrade to pro version to get additional templates as the honeycomb layout and scrolling carousel. If you really need any of these layouts, then upgrade to pro, but usually, you won’t need to do so as all the features are already present in the free version. Another great plugin available on CodeCanyone by an elite developer. It has already been sold 2,200+ times, with a rating of 4.71. You can display your team members in different styles like the normal grid or list appearance, or add them in circles, using a modal to show the data when they click, or adding them as slide-ins. They have it integrated with visual composer element to easily insert teams in their responsive display. The designs are clean and you can preview them here. And for 20$ that is not a lot of money for the features you get. If you like the appearance, then you will definitely like the plugin. This is not a team showcase plugin that showcases your team. Instead, this is a team management tool to help you streamline the process of managing your team, and getting jobs done faster. You can start by creating a project list where you can add to-do lists and then there would be milestones and maybe discussions by the team. You can add milestones as you specify so that you keep the team motivated. The discussions are like a mini forum to discuss things right inside WordPress, something like slack for each project but inside WordPress directly for better productivity. And I am just scratching the surface. Most of the important features are available in the free plugin, which you can download for free by clicking here. If you want the extra features like time tracker, kanban board, and uploading files and so on, then you can check the different plans available on their site. Kanban Boards is another simple tool to help you manage your team and get things done faster. It is less sophisticated than the above tool, but that is also a benefit. Consider it like Trello for WordPress because it is actually the same system, just present in WordPress. You can add things in columns, and assign tasks to members and they move it from one column to another to get it done. This help streamline the process while seeing the big picture. We use this to manage the content on this site. You can download it for free from the WordPress directory. It also has a pro version. Team Builder is nearly the same as the Team pro from the features standpoint, but the designs are a little bit more stylish, which may be good for specific brands. If you are looking a minimal design, then I think this is the right choice for you. One extra benefit here is that you could use it as a tool to display testimonials, but that could be done with other plugins. This is a plugin created by the team at GS Plugins. There is a free version you can get with few templates but I wouldn’t consider it because of there many better free plugins. The pro version is what you would consider with their added features like the support, custom CSS, GS team widget, extra templates, GS Team Shortcode generator, etc. The thing is the price to purchase the plugin. You either get it in a membership with the other premium plugins for 30$/year or 90$ for a lifetime license. It would be a steal if you would need some of the other plugins available. Otherwise, I would go with any of the other plugins here. WP Team Display is a great plugin created by the team at JoomUnited. 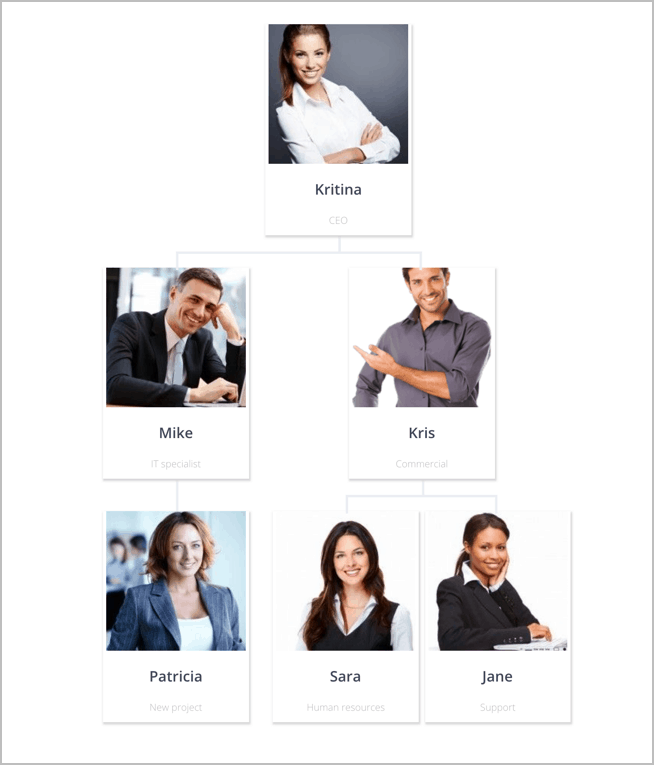 Unlike other team plugins, it helps you create a flowchart of the people available in the team, and then display them, so the manager appears first and so on. It has a Gutenberg block to load and to manage flowchart directly from Gutenberg editor. Once you click on a person, it displays data of him. This would be perfect for big companies and agencies. If you don’t follow in any of these categories, then I think a simple team display plugin would better suit your needs. You can get the plugin with 6 months of support for 29$ or you can get it for 39$ for a full year of support. As the name suggests, this plugin is only for Divi users. If you are not familiar with it, Divi is a great page builder created by the team at Elegant Themes. If you are in the WordPress industry for some time, then you already know about them. It offers a lot of options to edit and display your team members giving you the ultimate solution. With 56 layout style for team members module, 56 layout styles for grid modules, you can easily find what you need. This is the ultimate plugin for you if you want complete control over what to display or you are a developer who works on the Divi page builder. You can get it for 80$. Yes, that is a hefty price to pay, but if you want all the features, you can’t go wrong with it. This is a slider plugin that we already covered in our list of best WordPress Sliders plugins. The possibilities for using this plugin is endless. Yes, it is mainly a slider plugin, but that is all you need to display your team members in a good simple way without being confused with all the options available in other plugins. To create a team member slider in WordPress, Just follow their simple step-by-step guide. Which is the best team member plugin for you? So you already saw 12 plugins to help you showcase your teams and manage them. If you want the ultimate solution for managing your team, check out the WP Project Manager free and pro version. If you just want a simple-to-use plugin to streamline things, Kanban Boards is your tool. If you want the best free plugin to display your team members, you can’t go wrong with the Team Members plugin. After all, it is the most downloaded plugin. If you want the best pro plugin, then grab the Team Showcase WordPress Plugin for just $17. If you have the Divi page builder, then simply go with Divi Team Member. Now, tell me which plugin did you go with and what is your experience with it?